The free "Home Composting" workshop I wrote about several weeks ago finally came to pass. Sean and I joined about 20 of our neighbors at the local community session to learn about how to effectively compost at home. The class was outstanding! Grasscycling means mowing your grass regularly and leaving the clippings on the lawn. The clippings settle down, decompose, and offer nutrients back to the soil. Mowing while the grass is dry and taking small clippings helps speed up the settling and the decomposition. 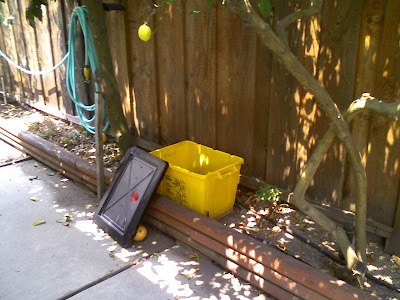 Backyard bins are just compost bins. Two basic categories are "hot" and "cold". While the name for the container is "bin" that word was also used as a synonym for "batch". Hot "bins" are filled at one time from stockpiles of waste and are actively managed over period of two weeks to three months. Cold "bins" are filled over time as waste accumulates, take less work, and take more time -- upto 18 months to complete. 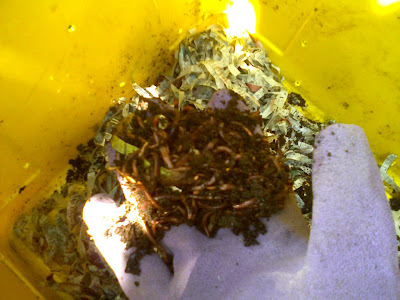 Vermincomposting is simply keeping a bed of red worms and feeding them fruit and vegetable scraps from the kitchen. We decided to give both a cold backyard bin and vermincomposting a try. Here you see a picture of our new worm bin. It's a modified recycling bin filled with wet, shredded newspaper, a cup or so of coffee grounds, and a pound of red worms. We've just fed them some withering strawberries and the lettuce from last week's box that I simply cannot bring myself to eat. We'll get started on the cold bin later this weekend.